"The Harbinger" novel proposes that God has sent America nine omens or warnings of judgment starting with the 9/11 attacks. These "harbingers" include the Great Recession seven years after 9/11 along with several surprising coincidences at Ground Zero and "vows" against God supposedly made by US leaders. Rabbi Cahn claims that in all this God is following the "prophetic warning pattern" of Isaiah 9:10 that leads to economic downfall if we do not repent. But is this a message from God or even accurate to how God speaks? When you compare this theory to the real pattern of warning and judgment that is spelled out not just in one verse to Israel but throughout the entire Bible, you can see for yourself whether America is in judgment or being warned of judgment just yet. To prove God is trying to warn or judge us, Christians usually find verses in the Old or New Testament that speak of things similar to what just happened. For example, there is a passage in Isaiah that speaks of “the day of the great slaughter, when the towers fall” (Isa 30:25) which was quoted for this purpose. They typically also employ surprising parallels or coincidences either in how things are spaced out on the calendar or in what people said or did, etc. This mixture of proofs is so intriguing for many that they are unable to come up with any other explanation for all the similarities and parallels than that, yes, God must have had a hand in it for it to happen the way it did. Nevertheless, most believers listening do see how strained and tortured the verses and comparisons are with theories like this and so they dismiss the theory. The Harbinger: The Ancient Mystery That Holds The Secret of America’s Future by Jonathan Cahn is different. It follows a similar approach for a similar theory of a divine origin for 9/11 in 2001—and the Financial Crisis of 2007-2008. But the difference is in how much greater intricacy, detail and skill he uses argue his theory. This leaves his audience much less able to poke holes in his assertions or to dismiss his theory. For that reason, The Harbinger has caught on and become a runaway bestseller in 2012. As such, many of my readers have read and later asked me what I thought of it. First of all, I congratulate Jonathan Cahn for managing to make such a catchy and popular book. Fiction or not, anything that gets people considering personal repentance and prayer towards changing expected judgment on their nation is good in my book. Many Christian leaders overlook that and focus on misuse of Scripture and bad hermeneutics that they see. There are many reviews of the book out there straining at such gnats and I think swallowing a camel (Mt 23:24). For me, the camel or major flaw with the book is something I did not see addressed in any of the Christian reviews, but will be explained in this article for the benefit of all those who do not know what to think about the Harbinger. “Before God judges a nation, He sends warning. He sent warning to ancient Israel. He even allowed its enemies to breach its borders in a devastating strike that would traumatize the nation. It was a wake-up call, the call to return to God. But the nation responded with defiance. God then gave Nine Harbingers of Judgment, nine prophetic signs, alarms, and foreshadows of what was to come. 09/11/2001 – WTC towers hit by planes and fall to the ground. 09/12/2001 – Senate Majority Leader Tom Daschle at Capital Hills says, “America will emerge from this tragedy as we have emerged from all adversity – united and strong...” and quotes Isaiah 9:10 about rebuilding and recovering. 09/28/2001 – Stock market crash (684 points). 11/22/2003 – A Norway Spruce “Tree of Hope” is planted at Ground Zero, replacing the lost sycamore. 09/11/2004 – Presidential candidate John Edwards Isaiah 9:10 about rebuilding in a speech in Washington, D.C on the third anniversary of 9/11. 04/27/2006 – America rebuilds on Ground Zero. (Freedom Tower breaks ground). 09/29/2008 – Stock market crash (777 points). Interpretation of Events – Subjective or Objective? After reading that list of events, do you see nine harbingers? Do you see any? Do you at least conclude that the hand of God must be behind them? Are you feeling a sense of remorse and need to repent? Do you feel embarrassed that your country has elected to rebuild what was destroyed? Do you feel it is defying God to do so? ...Because objectively speaking, there is no reason to conclude any of that; that any of the above events were directed by God or are against God or in defiance to him. Each one follows previous causes and effects. Nothing supernatural or complicated is required for any of them. When something like a building is lost, it is natural to want to replace it. “You need to read the book,” some would say. And therein lies the problem with The Harbinger's theory that God is trying to wake us up through these natural events. You need to hear Rabbi Cahn weave his long explanatory tale in order to see these very natural events as actually supernaturally directed harbingers of Isaiah 9:10. And even then, most people have a justifiably hard time swallowing the reasoning and conjecture of Cahn. They are not comfortable trusting in his opinion and interpretation of Scripture or events. It is too dependent on subjective data to be reliable. Cahn says America is in trouble for ignoring these warnings from God. But if no one can see or be sure that they are warnings from God without Cahn's dubious help, how is it reasonable for God to punish America or consider her defiant for rebuilding buildings they have no proof that God caused to be destroyed? Thankfully, God is not so capricious and unreasonable that he expects us to read tea leaves or to trust a man's subjective interpretation of normally explainable events to know his will. Instead, in the Bible we see a different pattern of how he makes himself clear, loud and clear. Repeatedly in the Bible stories, it is clear that Israelites knew who the prophets were in Israel (1Sa 3:20). These prophets became known or recognized as prophets because of the supernatural signs they performed (Ex 4:8-9), accurate words or predictions they gave (1Sa 3:19), speaking in conformity to previous revelation (Isa 8:20) being Hebrew and speaking in the name of YHVH (Dt 18:18-22). A prophet's reputation therefore preceded him (Mt 21:26). If someone did not know he was a prophet, he could always prove it to them as Moses did for the Israelites in Egypt through his snake-staff and two other signs God gave him (Ex 4:1-9). Then what he said better conform to God's previous Word (which rules out the future miracle-working False Prophet Rev 13:13). This is why people could be punished severely for mocking, disobeying or harming a prophet (2Ki 2:23-24). They were accountable for touching or disobeying “God's anointed” (1Ch 16:22). Obviously, God knows that if he does not certify and prove that someone is really speaking for him, people can use uncertainty over the authority of the speaker as an excuse to not listen or comply. God does not work with signs the way Cahn and most Christians imagine, as described at the start of this article in reference to post-9/11 explanations. God does not retroactively label events. That's for mere men. God knows the end from the beginning and causes unexpected or unexplainable things to happen. As such, in the Bible you see his signs being pronounced beforehand by his prophets: Elijah predicting fire coming down from heaven on the sacrifice at Mt. Carmel (1Ki 18:24); Samuel forecasting rain in the dry season as a sign to Israel of their disobedience (1Sa 12:17); Moses predicting Korah and his followers would be consumed for their rebellion in an unprecedented way (the earth opened up beneath them and swallowed them up! Nu 16:29-33). If 9/11 was a warning from God, it would have played out differently following this biblical pattern. A prophet would predict something unprecedented or supernatural and give an explanation of its meaning. Then when it happened just as he said it would, people who wanted to obey God would know it was God's hand and what they were supposed to do without any confusion or reasonable doubt. Likewise, God's judgment is preceded by warnings and explanations. If the judgment can be averted, the entire nation is warned including the leaders, as in the case of Israel, Judah with her prophets and Nineveh with Jonah. But if the nation is far too wicked and corrupt, God sends a warning to the righteous only, in a way that only they will hear, for them to leave. This is the case with Sodom where only Lot was found righteous (nine less than the ten righteous needed to save the city that Abraham was able to negotiate with God). Rabbi Cahn seems unaware of the concept that America is Mystery Babylon whose fate is already written into the latter category of warning to only the righteous to flee. After releasing this article, I immediately received several angry missives from obvious fans and supporters of Jonathan Cahn/The Harbinger. I will attempt to address the points they raised in this section. "You have insulted/attacked the teachings or person of Cahn!" Not at all. People who wrote this seem to miss that I commend Cahn for his work. I simply disagree with his concept of what the pattern of warning and judgment of God is. For some, any criticism, even constructive, is an attack or must come from dislike or malice. I have no malice and have not resorted to ad hominem attacks in this review. "Did you contact Mr. Cahn to share your concerns about his work, ask your questions directly to him before publicly criticizing a brother?" Again, I'm not criticizing the man; I commend him for his intriguing and bestselling novel, even if it patterns God's warnings off one tortured verse instead of consensus of the entire Bible. And, no, I did not contact him. I had no questions for Rabbi Cahn nor any obligation to share my concerns with him. When he published a book, he entered the public arena. As such, critics are not obligated to contact him privately. People are receiving his teaching in that public forum so our criticism must also be done in public for the benefit of his readers. "Jonathan Cahn is not a prophet, he's a watchman!" I never called him a prophet or even a false prophet, although others do both. Anyone who wants to call him a watchman should realize that to be a watchman you need to be a prophet, too, first, like Ezekiel was (Eze 2:1-3), to "hear the word at my mouth" from God to "give them warning from" him. Plus, God tells you audibly you are a watchman (Eze 3:17). You don't just feel, sense, or assume it. Thus, Jonathan Cahn is not a prophet or a watchman...which is fine. A person studying and sharing their conclusions from the words of the real prophets can do a lot of good just the same. "There are no more prophets, the Bible is all we have so Cahn is right to use it the way he did!" When Christians read the standards given above from the Bible for discerning prophets and messages from God, they are right to conclude there are no people in the office of prophet today. People receive minor words for themselves or others, but no one is authorized or certified by God today in a capacity in order to warn people or leaders of the nation like we see the ancient prophets of Israel and Judah did. 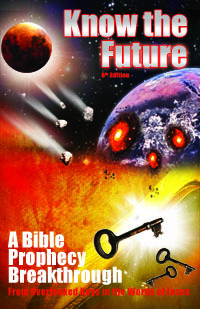 But most miss that Bible prophecy says that this will end in the future. Prophets are coming again. We will have (in order of appearance): the end time Elijah (Mal 4:5=Rev 18:4) (John the Baptist was only a forerunner who did not fulfill "all things" - Mt 17:11), the 144,000 (Rev 7:3-4=Rev 14:3,6-7), and the Two Witnesses (Rev 11:3-6). Knowing that real prophets are coming is comforting and helps us to not settle for anything less as a source for a real message from God to the nation. "America is under judgment...for 50 years already even!" When America is judged, she will be destroyed in a single day and hour (Rev 18:10). It won't last one year of his judgment, let alone 50. But before that happens, a message from heaven will be delivered to warn the righteous to flee (Rev 18:4). This has not happened yet because America is not about to be judged yet. You can read more about that in this article on one reliable Sign of the End. The Harbinger is a very popular and certainly clever piece of writing for which Rabbi Cahn may be commended and thanked by people who want to see more people interested in the Bible and repentance. The many coincidences and parallels it describes between modern America, Israel and Scripture will impress and dazzle many believers who read it, bringing them enjoyment and a desire to get right with God. That's wonderful. But The Harbinger's story leaves most people wondering or doubting if the source of all the coincidences described is supernatural or not. If it is a prophetic message from God, then it is a very ineffective and unorthodox one compared to other much less dubious prophetic messages found in the Bible. The prophecies of the Bible were delivered by recognized and certified prophets of God. The Harbinger is a fictional novel that does not present itself as the Word of God, but the subjective observations and tenuous theories of someone reading what past prophets have said and speculating how they may be coming to pass today. The Harbinger is correct that God sends warnings before judgment, but it's a shame how completely it has missed what the simple pattern of judgment of God is. The true pattern throughout the Bible does not require a whole book to comprehend. The pattern is that when God really sent warnings to Israel and other nations, they were not unspecific, ambiguous, and subjective like the nine harbinger events are. They are repeated plain, clear instructions on what to do and why. There is no guesswork needed, not even in the opinion or person of the messenger because they will accompany their prophetic message with certifying signs (that Cahn does not offer) so all can be safely sure God is behind the messenger. Finally, events given as signs are not conveniently labeled and explained as such retroactively as Cahn has done, but are predicted and explained in advance as only God can do accurately. That caliber of messages and prophets are actually predicted to come in the end times. Don't settle for anything less. Until then, we should not think or worry that America is already being warned or judged as The Harbinger suggests. God is not so unfair that he would communicate a warning so obscurely that only one man could see it leaving the rest of us to have to buy his book to see it, too.